← “Cell Phones and Wi-Fi — Are Children, Fetuses, and Fertility at Risk”? Note: WUSA-9 was the original source for the above video, and this website used a direct link when it was available. When it was later noted that the video was no longer available through WUSA, SkyVision Solutions substituted an archived edited copy. From a smart grid industry perspective, safety claims for smart meters are made based upon industry testing documents demonstrating that emissions from individual smart meter devices comply with outdated Federal Communications Commission (FCC) exposure guidelines, and then referring to such documentation as a “study” showing that wireless smart meters pose no health risk. Unfortunately, FCC exposure guidelines were never formulated to fully protect human health. In fact, they are only believed to protect against injury that may be caused by acute exposures that result in tissue heating or electric shock and burn over a timeframe of several minutes of exposure. FCC exposure guidelines have no relevance to protect humans from chronic exposure to pulsed radiofrequency radiation emitted by devices such as smart meters. A utility company is incorrect to categorically state that a wireless smart meter device is “safe” due to compliance with current FCC exposure guidelines. There are consistently observed biological effects that occur at levels below FCC guidelines. As an example to help make the above point, in September 2011, the City of Naperville, Illinois, published a 96-page final testing report for its smart grid initiative. Although the summary report stated that the “smart grid equipment emitted RF power densities that are below the FCC guidelines,” the actual testing report contained the following additional statement: “This report does not address or comment on potential health impacts of low power non-ionizing RF.” This statement is quite revealing. It demonstrates that the consultants who prepared the report were aware of issues related to potential health impacts of “low power non-ionizing RF,” i.e., exposure levels below FCC guidelines and then purposely inserted a disclaimer that the 96-page report did not address such issues. So what good is the report in terms of demonstrating that wireless smart meter emissions are safe for widespread deployment into the human population? Chronic exposure to pulsed RF emissions from smart meters below FCC exposure guidelines is exactly what needs to be evaluated to assess the impact on human health. Although no studies have yet been performed (by the Federal government or anyone else) to demonstrate that smart meters are safe for the human population, a new independent report provides perspective on how adverse effects documented within the context of the BioInitiative Report 2012 would support a claim that adverse biological effects should be expected based upon the RF radiation levels produced from both smart meters and smart appliances. The report is entitled, “Biological Effects from RF Radiation at Low-Intensity Exposure, Based on the BioInitiative 2012 Report, and the Implications for Smart Meters and Smart Appliances,” dated June 11, 2013. The report was prepared by Ronald M. Powell (Ph.D., Harvard University, 1975). Refer to the figure shown below from the report. In simple terms, chronic exposure to pulsed RF radiation fields at levels above the horizontal yellow band band in the figure is a cause for concern for expected adverse effects. Notice that the outdated FCC exposure guidelines are annotated by the horizontal blue band at the top of the chart. Radiation levels for typical smart meters and smart appliances are shown with the green and blue lines. As you can see, radiation levels exceed the BioInitiative Report 2012 recommended action levels out to tens of meters in distance from the devices. 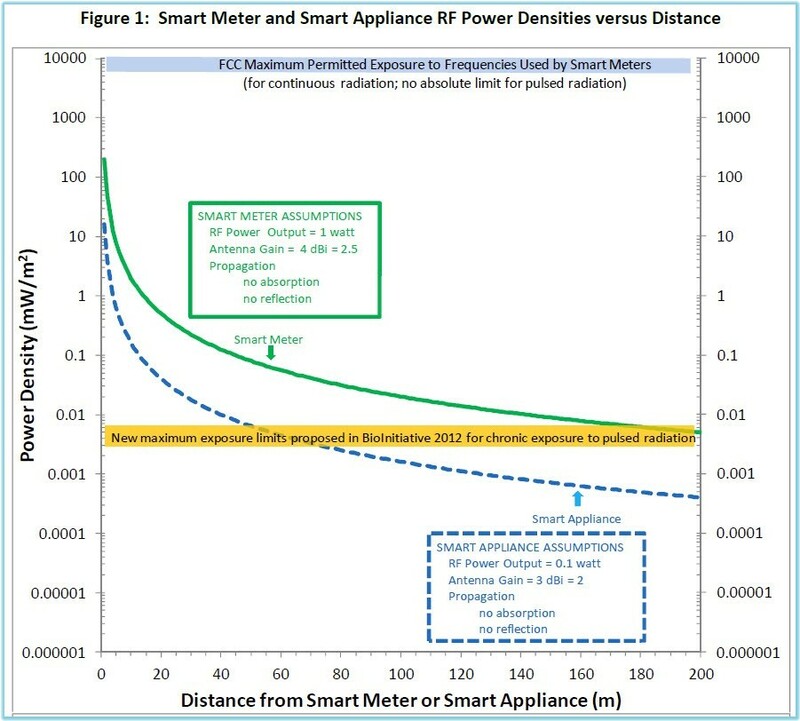 For the full report prepared by Dr. Powell, refer to the following link: https://skyvisionsolutions.files.wordpress.com/2013/06/powell-report-bioinitiative-report-2012-applied-to-smart-meters-and-smart-appliances_june_11_2013.pdf. The content of this website posting is intended to provide yet another rational explanation on why wireless smart meters should not be mandatory and why consumers should be able to “opt-out” without paying any fees or penalties. Beyond that, it actually becomes more apparent why wireless smart meters should not be rolled out at all. This entry was posted in Smart Grid, Smart Meters, and RF Emissions and tagged FCC, Health Effects, Opt-Out, Smart Meters, Smart Meters Safe. Bookmark the permalink.